Threading a sewing machine is one of the easiest things to do although it may appear to be a very difficult thing initially. But once you get a hang of it literally becomes a child’s play. Threading a sewing machine requires good eyesight. So if you have glasses, wear them while threading a machine. Just follow the steps mentioned below when threading a machine & you will be fine. Raise the needle to its highest position by slowly turning the hand wheel towards you. Also raise the presser foot along with it. Place a spool of thread on the spool holder. Pull a string of thread from the spool across the top of the machine looking for the thread guides. Insert the thread into the thread guides. If the spool pin is located horizontally then secure the spool of thread with the cap provided. Now pull the thread downward to the tension mechanism. Slide the thread between the disks of the tension mechanism & pull it back upwards through the next threading point located on the top left of the machine. Slip the thread through the lever located at the top left of the machine and down through the threading points at bottom left and above the needle. Thread the needle carefully. This may take time since the needle hole is really tiny. That is where your eyesight will be tested. Pull the thread through the needle hole a few inches to your left. Insert a round bobbin into the bobbin holder, if required, & pull a few inches of thread to the right. Some amount of thread should be sticking out under the closed throat plate. Hold the thread that has been threaded through the needle & rotate the hand wheel towards you until the needle enters the bobbin case. Keep rotating the hand wheel till the needle comes back up again at its highest position. Once that happens a loop bobbin thread will come up with it. Pull the loop thread further out of the bobbin case to your left. Let the thread go & keep pulling the bobbin thread until the end comes up. Pull the top & bottom threads under the presser foot towards you & start stitching. 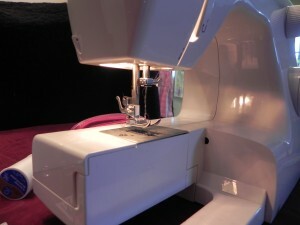 Every sewing machine is a little different from one another but the basic threading technique is almost the same in all of the sewing machines. If the threading mechanism in your machine is different from what we have described here then refer to owner’s manual for threading instructions. Always start sewing slowly to test if the threading has been done properly or not. Use good quality thread to prevent threads from breaking & causing damage to the machine. Detailed instruction of how to wind a bobbin & insert it into the bobbin case can be found on the owner’s manual of every machine.